Viral hepatitis affects more than 2 billion people worldwide. In particular, no effective treatment exists to abrogate death and liver damage in fulminant hepatitis. Activation of T cells is an initial and critical event in the pathogenesis of liver damage in autoimmune and viral hepatitis. The precise molecular mechanisms that induce T cell-mediated hepatocyte injury remain largely unclear. In mice, T cell-dependent hepatitis and acute liver damage can be modeled using ConA. In this study, we examined the role of the adhesion receptor LFA-1 in ConA-induced acute hepatic damage using LFA-1−/− (CD11a) mice. Massive liver cell apoptosis and metabolic liver damage were observed in LFA-1+/+ mice following ConA injection. By contrast, LFA-1−/− mice were completely resistant to ConA-induced hepatitis and none of the LFA-1−/− mice showed any hepatic damage. Whereas activated hepatic T cells remained in the liver in LFA-1+/+ mice, activated T cells were rapidly cleared from the livers of LFA-1−/− mice. Mechanistically, T cells from LFA-1−/− mice showed markedly reduced cytotoxicity toward liver cells as a result of impaired, activation-dependent adhesion. Importantly, adoptive transfer of hepatic T cells from LFA-1+/+ mice, but not from LFA-1−/− mice, sensitized LFA-1−/− mice to ConA-induced hepatitis. Thus, LFA-1 expression on T cells is necessary and sufficient for T cell-mediated liver damage in vivo. These results provide the first genetic evidence on an adhesion receptor, LFA-1, that has a crucial role in fulminant hepatitis. These genetic data identify LFA-1 as a potential key target for the treatment of T cell-mediated hepatitis and the prevention of liver damage. Liver diseases are major health care problems worldwide. It has been estimated that more than 2 billion people have been infected with hepatitis viruses and that ∼1% of people infected with hepatitis viruses develop acute fulminant hepatitis with no effective treatment option (1). Moreover, the liver is a target for autoreactive lymphocytes resulting in autoimmune hepatitis that very often require transplants (2). In both viral and autoimmune hepatitis, activation of macrophages and T cells are critical initial steps in the pathogenesis of liver damage and fulminant disease (3, 4). In mice, fulminant T cell-dependent hepatitis and acute liver damage can be modeled using in vivo administration of ConA. ConA is a T cell mitogenic lectin that induces polyclonal T cell activation in vitro and causes severe and acute liver injury in mice that is dependent on the presence of T lymphocytes (5). Following ConA administration, T cells and macrophages release high levels of cytokines such as IL-2, IL-1, IL-6, IFN-γ, IL-4, IL-12, or TNF-α as well as nitric oxide that have been linked to the development of hepatic lesions (6, 7, 8, 9, 10, 11, 12, 13). In addition, cytotoxicity mediated via Fas ligand (FasL)4 and perforin have been implicated in ConA-induced hepatitis (14, 15, 16). FasL- and perforin-mediated cytotoxicity is dependent on the attachment to target cells by the effector cells (17, 18). Moreover, IFN-γ and TNF-α can induce the expression of ICAM-1 on rat parenchymal hepatocytes and LFA-1-ICAM-1 interactions play an important role in the interaction between hepatocytes and lymphocytes (19). Moreover, it has been shown that Abs to LFA-1 or ICAM-1 can inhibit T cell cytotoxicity to hepatocytes (14, 15, 16), suggesting that cell adhesion between activated T cells and liver cells might be an important initial step in liver damage. The leukocyte integrin LFA-1 was initially defined by mAbs that inhibit CTL-mediated cytotoxicity in the absence of complement (20). However, LFA-1-deficient mice display normal CTL responses against systemic choriomeningitis virus and vesicular stomatitis virus infections (21) and loss of LFA-1 alone has only minor effects on the cytotoxicity of NK1.1+TCRαβ+ T cells (22), suggesting that the consequences of anti-LFA-1 mAbs may reflect nonspecific effects of Ab treatment, such as capping of other surface molecules. Thus, the in vivo function of LFA-1 in the generation of cytotoxic T cell responses was unclear. Moreover, no adhesion receptor has been genetically identified yet that is indeed critical for liver damage. In this study, we investigated the role of the adhesion receptor LFA-1 in ConA-induced hepatitis, using LFA-1−/− gene-deficient mice (21). We show that LFA-1 has an essential role in the ConA-induced hepatitis. The cytotoxic machinery of mutant ConA-activated hepatic T cells appeared functional but the adhesion between activated hepatic T cells and liver cells was impaired in the absence of LFA-1 expression. Importantly, adoptive transfer of hepatic T cells from LFA-1+/+ mice, but not from LFA-1−/− mice, sensitized LFA-1−/− mice to ConA-induced hepatitis. Thus, LFA-1 expression on T cells is necessary for T cell-mediated liver damage in vivo. These results provide the first genetic evidence on an adhesion receptor, LFA-1, that has a crucial role in fulminant hepatitis. Mutant mice lacking LFA-1 (H-2b) generated by gene-targeting technology have been described previously (21). The mutant mice were backcrossed more than six times to a C57BL/6 (H-2b) background and maintained in specific pathogen-free conditions. As control, age-matched LFA-1+/+ littermate mice were used. All mice used were 8- to 10-wk-old and maintained at the Kanagawa Dental College (Kanagawa, Japan) in accordance with college guidelines. TLR2 and NMuLi cell lines were purchased from the Riken Cell Bank (Tsukuba, Japan). ConA (Seikagaku Kogyo, Tokyo, Japan) was dissolved in PBS and i.v. injected to mice via the tail vein in a dose of 20 mg/kg. Serum activities of alanine aminotransferase (ALT) and aspartate aminotransferase (AST) were measured by a standard photometric method using a Hitachi type 7070 automatic analyzer (Tokyo, Japan). To analyze the in vivo effects of ICAM-1 inhibition in Con A-induced hepatitis, LFA-1+/+ mice were i.v. injected with anti-ICAM-1 mAbs (clone 3E2) at 24 and 2 h before Con A injection. Paraffin-embedded liver samples were cut into 5-μm sections, deparaffinized in xylene, and rehydrated through a series of decreasing concentrations of ethanol. Sections were stained with H&E. For in situ detection of apoptosis, paraffin-embedded sections were pretreated for 10 min at room temperature with 20 μg/ml proteinase K (DAKO, Carpinteria, CA). The TUNEL apoptosis assay was an Apo Tag Plus Peroxidase In Situ Apoptosis Detection kit (Intergen, Purchase, NY). For detection of ConA-induced apoptosis of hepatic T cells, hepatic T cells were purified at different time points following ConA injection using nylon wool. Cell death was detected by TUNEL staining (APO-DIRECT kit; BD PharMingen, San Diego, CA). For immunohistochemical studies on liver T cells, 4% paraformaldehyde-fixed and paraffin-embedded sections were stained using an anti-CD3-ε polyclonal Ab (clone M-20; Santa Cruz Biotechnology, Santa Cruz, CA). The primary Ab was detected using the Histofine SAB-PO (G) kit (Nichirei, Tokyo, Japan) according to the manufacturer’s instructions. The liver was pressed through a stainless steel mesh and cells were suspended in PBS. Total liver cells were resuspended in a 40% isotonic Percoll solution (Amersham Pharmacia Biotech, Piscataway, NJ) and underlaid with 80% of isotonic Percoll. Following centrifugation for 20 min at 2000 × g, mononuclear cells (MNC) were harvested at the 40–80% interface. The pellet was resuspended in RBC lysis solution (0.17 M NH4Cl, 0.01 mM EDTA, and 0.1 M Tris-HCl, pH 7.3), washed twice in PBS, and subjected to flow cytometry and PCR analysis. For the enrichment of hepatic NK1.1−TCRαβ+ cells, cells were purified by negative selection using T cell enrichment columns (R&D Systems, Minneapolis, MN) according to the manufacturer’s instructions. Purity of the recovered cells was verified by two-color flow cytometry analysis. The recovered cells contained >95% NK1.1−TCRαβ+ and >93% B220−TCRαβ+ cells. LFA-1−/− host mice (6 wk of age) received hepatic NK1.1−TCRαβ+ cells (1 × 107 cells) from LFA-1+/+ or LFA-1−/− donor mice via tail vein transfer. One hour after the T cell transfer, the mice were injected i.v. with ConA (20 mg/kg). Serum AST and ALT levels and histological changes of liver were determined 12 h after the ConA injection. Surface phenotypes of cells were identified by using mAbs in conjugation with two- or three-color immunofluorescence. MNCs were resuspended in immunofluorescence staining buffer (PBS, 4% FCS, 0.1% NaN3) and incubated with the appropriate mAbs for 30 min. To block unspecific binding via FcγRs, samples were preincubated with a nonconjugated CD32/16 mAb (clone 2.4G2) for 15 min. The following anti-mouse mAbs were used: anti-NK1.1 (PE-conjugated, clone NKR-PC1), anti-TCRαβ (FITC-conjugated, clone H57-597), anti-CD69 (biotin-conjugated, clone H1.2F3), anti-LFA-1/CD11a (biotin-conjugated, clone M17/4), anti-CD4 (PE-conjugated, clone GK1.5), anti-CD8α (FITC-conjugated, clone 53-6.7), anti-CD25 (biotin-conjugated, clone 7D4), anti-ICAM-1 (FITC-conjugated, clone 3E2), anti-ICAM-2 (FITC-conjugated, clone 3C4), and anti-Fas (PE-conjugated, clone Jo2) (all from BD Biosciences, Mountain View, CA). Biotin-conjugated mAbs were visualized using streptavidin CyChrome (BD Biosciences). Cells were analyzed using a FACScan and CellQuest software (BD Biosciences). Hepatic NK1.1− TCRαβ+ cells (2 × 105) from LFA-1+/+ and LFA-1−/− mice were cultured in the presence of 4 μg of ConA in 96-well round-bottom plates (Costar, Cambridge, MA) at 200 μl/well. After incubation for 36 h, 100 μl of culture supernatants were harvested to detect IL-2 production using the Biotrac mouse IL-2 ELISA system (Amersham Pharmacia Biotech) and [3H]thymidine at 1 μCi/50 μl medium was added per well and incubated for another 12 h. Proliferation was measured by [3H]thymidine incorporation using an Aloka type LSC-5100 liquid scintillation counter (Tokyo, Japan). Serum levels of IL-4, IFN-γ, and TNF-α were determined in individual mice using mouse IL-4, IFN-γ, and TNF-α ELISAs (Amersham Pharmacia Biotech). Cytotoxic activity of hepatic NK1.1− TCRαβ+ cells was tested against murine NMuLi liver cells (23) using 51Cr-release assays. Briefly, target cells were loaded with 51Cr for 1 h, washed, and 51Cr-loaded target cells (1 × 104/well) were plated in triplicate into 96-well V-bottom plates (Costar). Target cells were incubated with hepatic NK1.1−TCRαβ+ cells at the indicated E:T ratios in a total volume of 200 μl of 10% FCS in RPMI 1640 medium for 4 h. After incubation, the supernatant was harvested and counted. Specific cytotoxicity was calculated as described (22). In some experiments, cytotoxicity assays were performed in the presence of anti-LFA-1 (clone M17/4), anti-ICAM-1 (clone 3E2), or anti-ICAM-2 (clone 3C4)-blocking mAbs. Hepatic NK1.1−TCRαβ+ cells (2 × 106 cells) were lysed in 10 mM EDTA, 1% SDS, 60% (v/v) glycerol, and 0.5% bromophenol blue. Proteins were separated by 10% SDS-PAGE, transferred to polyvinylidene difluoride membranes (Millipore, Bedford, MA), and membranes incubated in blocking solution (5% skim milk; 0.1% Tween 20 in PBS) at room temperature for 1 h to block nonspecific Ab binding. Membranes were then incubated with a polyclonal anti-FasL Ab (clone C-178; Santa Cruz Biotechnology) at a dilution of 1/1000 or anti-perforin mAb (clone CB5.4; Wako Pure Chemical) at a dilution of 1/1000 at room temperature for 1 h and washed three times in PBS/0.1% Tween 20. As a control, membranes were probed with a polyclonal anti-actin Ab (clone I-19; Santa Cruz Biotechnology). Membranes were then incubated with HRP-conjugated secondary Abs (Amersham Pharmacia Biotech) and washed three times in PBS/0.1% Tween 20. Immune complexes were detected by ECL (Amersham Pharmacia Biotech) according to the manufacturer’s protocol. For RT-PCR, total cellular RNA was extracted using TRIzol (Life Technologies, Grand Island, NY). Single-strand cDNA was synthesized with reverse transcriptase from 2 μg of RNA and used for PCR. Primer sequences were as follows: IL-4, 5′ primer-ATGGGTCTCAACCCCCAGCTAGT and 3′ primer-GCTCTTTAGGCTTTCCAGGAAGTC; IFN-γ, 5′ primer-GCTCTGAGACAATGAACGCT and 3′ primer-AAAGAGATAATCTGGCTCTGC; TNF-α, 5′ primer-GATCTCAAAGACAACCAACTAGTG and 3′ primer-CTCCAGCTGGAAGACTCCCAG; β-actin, 5′ primer-CGTGACATCAAAGAGAAGCTGGTCC and 3′ primer-GCTCAGGAGGAGCAATGATCTTGAT. Various amounts of cDNA were amplified in PCR under the following conditions: 94°C for 1 min, 62°C for 1 min, and 72°C for 1 min with 25 cycles. After amplification, PCR products were separated by electrophoresis on 1.5% agarose gels. Hepatic NK1.1− TCRαβ+ cells were isolated and prepared as effector cells. Murine liver NMuLi cells were labeled with PKH2 fluorescence (Zynaxis Cell Science, Malvern, PA) for 10 min at 37°C and washed five times in 10% FCS in RPMI 1640 medium to remove unbound fluorochromes. Labeled NMuLi cells (1 × 105 cells) and effector cells (2 × 105 cells) were then mixed together in a total volume of 1 ml of 10% FCS in RPMI 1640 medium and centrifuged for 5 min at 1000 × g. Pellets were incubated for 10 min at 37°C and resuspended in ice-cold PBS to stop conjugate formation. Binding between NMuLi target and effector cells was determined using FACScan. Hepatic NK1.1− TCRαβ+ cells were gated and analyzed for PKH2 expression representing NMuLi cells and effector cells conjugate formation (22). In some experiments, conjugate formation assays were performed in the presence of anti-LFA-1, anti-ICAM-1, or anti-ICAM-2 blocking mAbs. To determine the role of the LFA-1 adhesion receptor in ConA-induced hepatitis, we injected ConA into LFA-1−/− mice, and the induction of hepatitis and liver damage was evaluated by measuring the activities of the hepatic enzymes ALT and AST in the serum 3, 6, 12, and 24 h after ConA injection. Following ConA administration, the activities of both ALT and AST were rapidly increased in LFA-1+/+ mice, reaching their peak values at 12 h (Fig. 1⇓). In contrast, no increase in the levels of either ALT or AST was detected in LFA-1−/− mice (Fig. 1⇓). We then conducted histological examinations of the liver 3, 6, 18, and 24 h after ConA injection (Fig. 2⇓). In LFA-1+/+ mice, massive hepatic lesions were observed starting at 6 h after ConA challenge and the onset of these lesions correlated with the levels of ALT and AST in the serum. 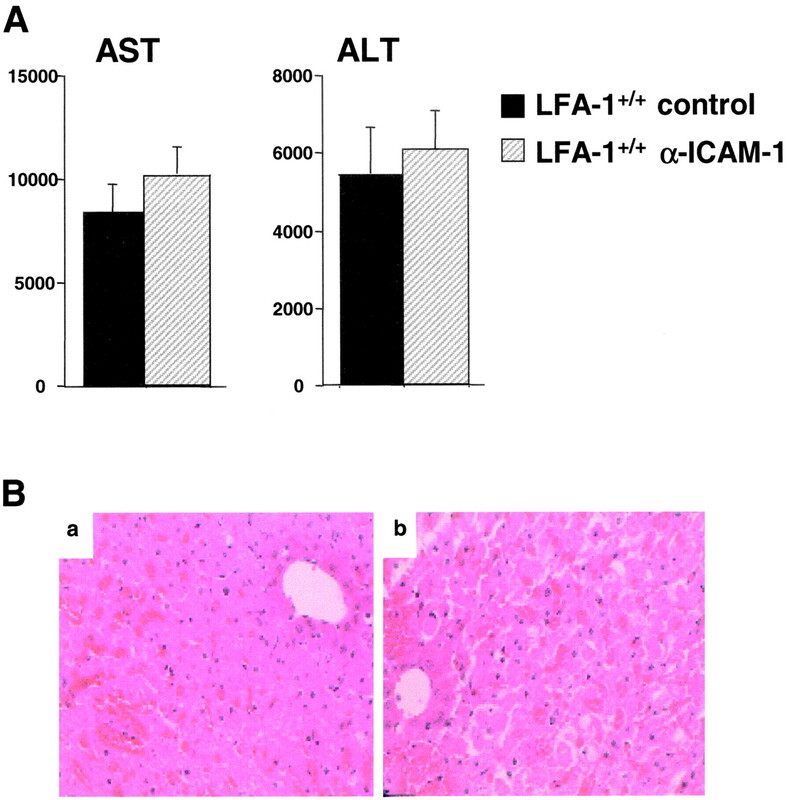 By contrast and in line with the normal ALT and AST levels, livers from LFA-1−/− mice appeared normal in histology even at late time points after ConA injection. LFA-1 expression is required for ConA-induced hepatitis. Serum transaminase activities after ConA injection in LFA-1+/+ mice (•) and LFA-1−/− mice (○). Serum AST and ALT activity levels were assessed at different times following ConA injection. Five mice were used in each group. Mean transaminase activities of AST and ALT ± SD are shown. LFA-1 mutant mice are protected from ConA-induced liver damage. 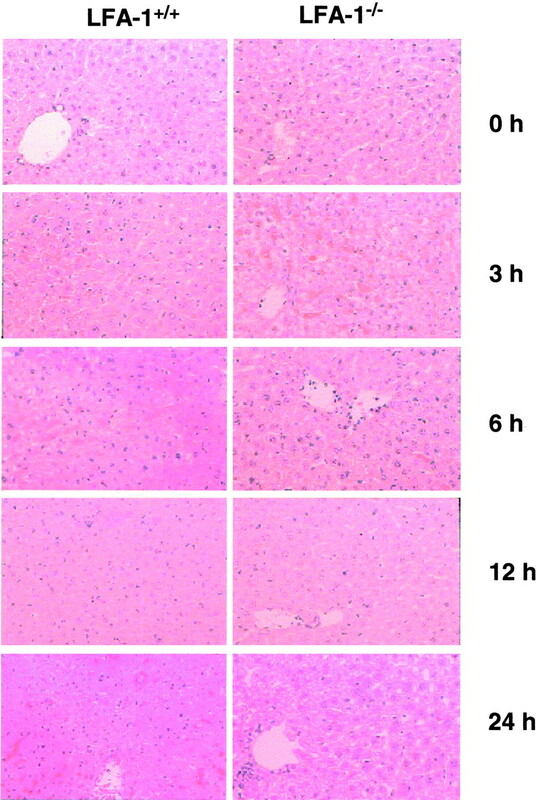 Histological changes of the liver after different time points of ConA injection in LFA-1+/+ (left) and LFA-1−/− (right) mice. Light micrographs of livers stained with H&E (magnification, ×100) are shown for one representative experiment. TUNEL staining revealed the existence of massive apoptosis of liver cells in LFA-1+/+ mice (Fig. 3⇓). In contrast, TUNEL-positive cells were not detectable in LFA-1−/− mice. LFA-1−/− mice are healthy even days after ConA injection, that is, there is not a delayed response. In ConA-injected LFA-1+/− mice, the extents of ALT and AST levels and histological liver damage and apoptosis were comparable to that of LFA-1+/+ littermates (not shown). As expected, LFA-1+/− mice also showed fulminant hepatitis as observed in LFA-1+/+ mice (not shown). It should be noted that the livers of LFA-1−/− mice were histologically identical to that of LFA-1+/− and LFA-1+/+ mice at baseline. These results show that loss of LFA-1 expression results in complete protection from ConA-induced hepatitis and liver damage. Absence of apoptotic hepatocytes in LFA-1−/− mice. TUNEL staining (brown nuclear staining of small nuclei) of the liver after different time points following ConA injection in LFA-1+/+ (left) andLFA-1−/− (right) mice. Magnification, ×100. Data from one representative experiment are shown. It has been shown that LFA-1-ICAM-1 interactions play an important role in the interaction between hepatocytes and lymphocytes and that Abs to LFA-1 or ICAM-1 can inhibit T cell cytotoxicity to hepatocytes in vitro (14, 15, 16). Therefore, we analyzed whether administration of an anti-ICAM-1 blocking mAb in vivo inhibits the liver injury induced by Con A. However, inhibition of ICAM-1 in LFA-1+/+ mice did not alter the course of ConA-induced hepatitis and massive liver damage was still evident as detected by increased serum ALT and AST levels (Fig. 4⇓A). Moreover, the histological lesions in the livers were comparable between nontreated and anti-ICAM-1-treated LFA-1+/+ mice following ConA challenge (Fig. 4⇓B). These results indicate that treatment with anti-ICAM-1 mAb does not inhibit Con A-induced hepatitis. ICAM-1 inhibition does not protect from Con A-induced liver damage. LFA-1+/+ mice were i.v. injected with 200 μg of the anti-ICAM-1 blocking mAb (clone 3E2) 24 and 2 h before administration of Con A. Serum AST and ALT transaminase activities (A) and liver histologies (B) were assessed at 24 h after ConA challenge. Liver histologies after the Con A injection with no anti-ICAM-1 mAb treatment (Ba) and anti-ICAM-1 mAb treatment (Bb) are shown. Both anti-ICAM-1 mAb treated and untreated livers showed massive infiltration of RBCs together with hepatocyte damage. ConA is a T cell mitogen that induces polyclonal T cell activation and liver injury (5). The total numbers and proportions of T cells and B cells in the liver before and after ConA injection were comparable among LFA-1+/+ and LFA-1−/− mice (Fig. 5⇓A). Following ConA injection, the proportion of activated hepatic NK1.1−TCRαβ+ as detected by expression of the CD69 activation marker increased with a similar kinetic in the livers of both LFA-1+/+ and LFA-1−/− mice (Fig. 5⇓B). Similar to CD69 expression, the kinetics and activation-dependent expression levels of CD25 (IL2Rα chain) were comparable between ConA-injected LFA-1+/+ and LFA-1−/− mice (Fig. 6⇓A). Surface levels and the kinetics of induction of CD69 and CD25 expression on both CD4+ (not shown) and CD8+ (Fig. 6⇓B) T cells were also comparable among LFA-1+/+ and LFA-1−/− mice. Activation of hepatic NK1.1−CRαβ+ cells after ConA injection. A, At different time points after Con A injection, hepatic mononuclear cells were harvested and percentages of CD3ε+ T cells and IgM+ B cells were determined by flow cytometry. B, Hepatic NK1.1−TCRαβ+ T cells were isolated from the livers of LFA-1+/+ (left panels) and LFA-1−/− (right panels) mice at the indicated time periods following ConA injection and were stained with anti-CD69 (FITC) and anti-TCRαβ (PE) Abs. Numbers indicate relative percentages of cells within the CD69+TCRαβ+ quadrant. One result representative of five experiments is shown. Activation phenotypes of hepatic NK1.1 −CRαβ+ cells. A, Induction of CD25 surface expression on gated hepatic NK1.1−TCRαβ+ cells isolated from LFA-1+/+ and LFA-1−/− mice at the indicated time period after ConA injection. Black, green, and red lines indicate 0, 4, and 8 h after ConA injection, respectively. One result representative of three experiments is shown. B, Induction of CD69 and CD25 expression on gated hepatic CD8+ cells isolated at the indicated time period after ConA injection. Black, green, blue, and red lines indicate 0, 4, 8, and 12 h after ConA injection, respectively. One result representative of three experiments is shown. Similar results were obtained for hepatic CD4+ T cells (not shown). C, Increased LFA-1 expression in hepatic NK1.1−TCRαβ+ T cells after ConA injection. Hepatic NK1.1−TCRαβ+ T cells were isolated at the indicated times and were stained with anti-NK1.1 (PE), anti-TCRαβ (biotin), and anti-LFA-1 (FITC) mAbs. Histograms correspond to gated NK1.1−TCRαβ+ cells and indicate the surface expression of LFA-1 on these cells. Black, yellow, blue, green, and red lines indicate 0, 3, 6, 12, and 24 h after ConA injection, respectively. Similar results were obtained in three independent experiments. D, Detection of apoptotic hepatic T cells in vivo after ConA injection in LFA-1+/+ and LFA-1−/− mice. At the indicated time points after ConA injection, hepatic T cells were purified and analyzed for apoptosis by TUNEL assay. However, whereas CD69+TCRαβ+ activated T cells increased in percentages and remained activated in LFA-1+/+ mice, the increase in activated CD69+CD25+TCRαβ+ T cells was only transient in LFA-1−/− mice and activated NK1.1−TCRαβ+ T cells of both CD4 and CD8 lineages were rapidly depleted from the livers of these mice (Fig. 5⇑B). In contrast to the activation of NK1.1−TCRαβ+ cells, expression of CD69 and CD25 on hepatic NK1.1+ TCRαβ− NK cells and NK1.1+TCRαβ+ cells was not elevated 4–8 h after ConA injection in both LFA-1+/+ and LFA-1−/− mice (not shown) indicating that ConA administration primarily activates hepatic NK1.1−TCRαβ+ cells T cells in vivo. In addition, ConA injection markedly induces the expression of LFA-1 on the hepatic NK1.1−TCRαβ+ cells (Fig. 6⇑C). Because T cells on activation undergo activation-induced cell death, we measured the apoptosis of ConA-activated liver T cells by flow cytometry. Apoptosis induction in T cells peaked at 12 h and declined by 24 h. However, the percentages of apoptotic hepatic T cells in the livers were comparable between ConA-injected LFA-1+/+ and LFA-1−/− mice at all time points analyzed (Fig. 6⇑D). 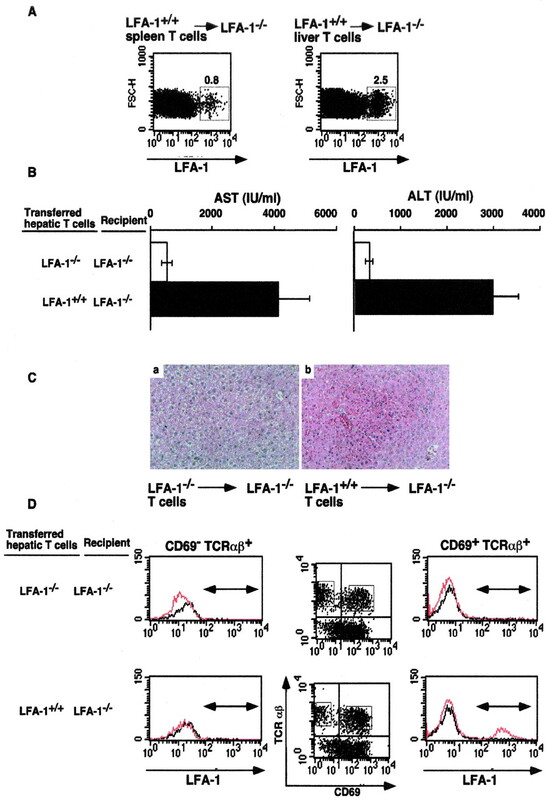 These results show that the activation and cell death of hepatic TCRαβ+ T cells are similar in LFA-1+/+ and LFA-1−/− mice; however, in the absence of LFA-1 expression these activated T cells fail to induce liver damage and hepatocyte apoptosis. To extend the apparently normal activation of NK1.1−TCRαβ+ cells in vivo (Figs. 5⇑ and 6⇑), we isolated “naive” NK1.1−TCRαβ+ T cells from nontreated LFA-1+/+ and LFA-1−/− mice and assayed their response to ConA stimulation in vitro. The ConA-induced proliferative response (Fig. 7⇓A) of hepatic NK1.1−TCRαβ+ cells as well as production of the cytokine IL-2 (Fig. 7⇓B) were comparable among hepatic NK1.1−TCRαβ+ cells from LFA-1−/− and LFA-1+/+ littermates. Moreover, “naive” hepatic NK1.1−TCRαβ+ cells from both LFA-1−/− and LFA-1+/+ littermates increased the expression of the activation markers CD69 and CD25 to similar levels (Fig. 7⇓C) and at similar kinetics (not shown). Similar to in vivo activated liver NK1.1−TCRαβ+ T cells (Fig. 6⇑C), the expression of LFA-1 on NK1.1−TCRαβ+ cells from LFA-1+/+ mice significantly increased after in vitro ConA stimulation (Fig. 7⇓C). Thus, loss of LFA-1 expression has no apparent effect on ConA-induced proliferation and activation of hepatic NK1.1−TCRαβ+ cells in vitro and in vivo. However, the potential role of LFA-1 in cell survival needs to be tested. 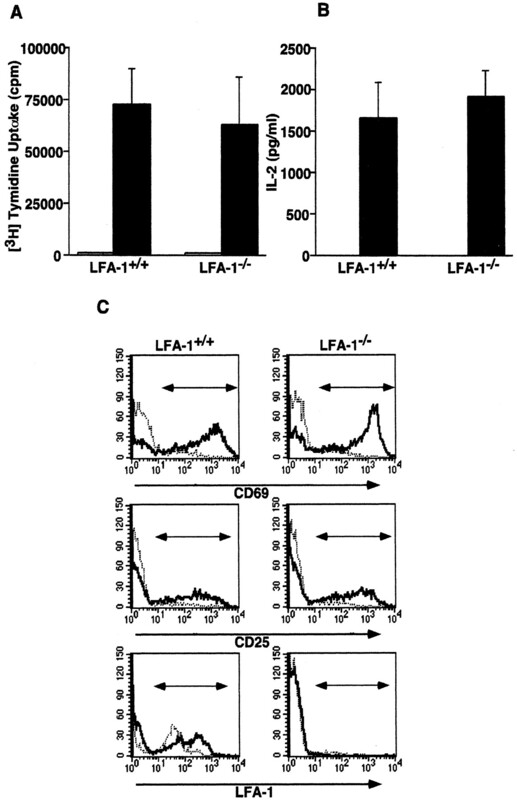 Normal in vitro activation of LFA-1−/− T cells. A, Normal proliferative response of LFA-1−/− T cells. Purified “naive” hepatic NK1.1−TCRαβ+ T cells were cultured in medium alone (□) or 4 μg/ml ConA (▪). Results are presented as mean [3H]thymidine uptake (± SD) from one of two similar experiments. Similar results were obtained using different concentrations of ConA (not shown). B, IL-2 production of hepatic NK1.1−TCRαβ+ T cells cultured in medium alone (□) or 4 μg/ml ConA (▪). Results are presented as mean ± SD of one representative experiment. C, Surface expression of CD69, CD25, and LFA-1 on in vitro ConA-activated hepatic NK1.1−TCRαβ+ T cells. Surface expression of the indicated molecules was assayed by flow cytometry 48 h after stimulation with 4 μg/ml ConA. Dotted lines represent expression on unstimulated control cells. Our results indicated that the absence of LFA-1 does not impair the activation of hepatic NK1.1−TCRαβ+ cells. We next examined the cytotoxic activity of ConA-activated hepatic NK1.1−TCRαβ+ cells from LFA-1+/+ and LFA-1−/− mice against the mouse liver cells NMuLi, that express ICAM-1, ICAM-2, and Fas on the cell surface (not shown). Whereas ConA-activated liver NK1.1−TCRαβ+ cells from LFA-1+/+ mice rapidly lysed NMuLi cells, the cytotoxic activity of ConA-activated liver NK1.1−TCRαβ+ cells from LFA-1−/− mice was significantly impaired (Fig. 8⇓A). Similar results were obtained when we used the hepatocyte cell line TLR2 (data not shown). Thus, loss of LFA-1 expression results in impaired cytotoxicity toward liver cells. Impaired cytotoxicity and cell adhesion of hepatic LFA-1−/− NK1.1−TCRαβ+ T cells. A, Hepatic NK1.1−TCRαβ+ cells were purified from LFA-1+/+ (•) and LFA-1−/− (▪) mice 24 h after ConA injection, and their cytotoxic activity was assayed against mouse NMuLi liver cells at the indicated E:T ratios. Open symbols indicate 0 h after ConA injection. Results are presented as mean ± SD of one of three similar experiments. B, Expression of IL-4, IFN-γ, and TNF-α mRNA in hepatic NK1.1−TCRαβ+ cells. Total RNA was prepared from hepatic NK1.1−TCRαβ+ cells from LFA-1+/+ and LFA-1−/− mice at the indicated time points after ConA injection and was used as template for RT-PCR analysis for IL-4, IFN-γ, TNF-α, and β-actin (control). Each sample was serially diluted before the PCR as indicated above the panel. C, Western blot analysis of FasL and perforin protein expression in purified hepatic NK1.1−TCRαβ+ cells from LFA-1+/+ and LFA-1−/− mice isolated at the indicated time points after ConA injection. One result representative of three independent experiments is shown. D, Conjugate formation between NMuLi hepatocytes and hepatic NK1.1−TCRαβ+ cells isolated from LFA-1+/+ and LFA-1−/− mice at 0 h and 24 h after ConA injection. Binding of PKH2-labeled mouse NMuLi cells to hepatic NK1.1−TCRαβ+ cells was as described in Materials and Methods. The percentages of conjugate formation indicate PKH2-positive cells. Note that the loss of LFA-1 does not affect baseline adhesion of “naive” T cells. One result representative of three independent experiments is shown. E and F, Anti-LFA-1 blocking mAbs but not anti-ICAM-1 and ICAM-2 mAbs inhibit the cytotoxic activity (E) and cell adhesion (F) of ConA-activated hepatic NK1.1−TCRαβ+ T cells to hepatic NMuLi cells. F, Relative percentages (%) of conjugate formation (mean of triplicate ± SD) compared with conjugate formation by untreated LFA-1+/+ T cells (100%) are shown. The differences between cytotoxic activity and conjugate formation by untreated LFA-1+/+ T cells compared with anti-LFA-1 mAb treated LFA-1+/+ T cells were statistically significant (p > 0.05). One result representative of three independent experiments is shown. It has been reported that IL-4, IFN-γ, and TNF-α play pathogenic roles in ConA-induced hepatitis (6, 7, 8, 9, 11, 12, 13). Moreover, it has been shown that FasL and perforin expression in effector cells is critical for their cytotoxic activities (15, 16, 17). To investigate whether loss of LFA-1 resulted in decreased expression of cytokines and/or cytotoxic effector molecules, we first examined the serum levels of IL-4, IFN-γ, and TNF-α by ELISA and the expression levels of these cytokines in hepatic NK1.1−TCRαβ+ by RT-PCR. Serum IL-4 and IFN-γ levels were increased after 6 h of ConA injection but almost normalized after 24 h in both LFA-1+/+ and LFA-1−/− mice. Serum TNF-α levels could not be detected at these time points (not shown). In purified liver NK1.1−TCRαβ+ T cells, ConA-induced expression of IL-4 mRNA was detectable within 3 h, and expression of IFN-γ and TNF-α mRNA was detectable within 6 h (Fig. 8⇑B). Expression of all cytokines returned to baseline levels at 18 h after ConA injection. Thus, kinetics and extends of IL-4, IFN-γ, and TNF-α expression levels were comparable among liver MNC isolated from LFA-1+/+ and LFA-1−/− mice. Moreover, there was no apparent difference in the expression levels of FasL and perforin protein among hepatic NK1.1−TCRαβ+ cells purified from LFA-1+/+ and LFA-1−/− mice (Fig. 8⇑C). These results show that the lack of LFA-1 expression has no apparent affect on the induction of the proinflammatory cytokines IL-4, IFN-γ, and TNF-α and expression of the death effector molecules perforin and FasL in hepatic NK1.1−TCRαβ+ T cells following ConA administration in vivo. Activation of hepatic NK1.1−TCRαβ+ cells in response to ConA was accompanied by an increase in the expression of the cell adhesion receptor LFA-1 (Fig. 6⇑C). To test whether the reduction of cytotoxic activity of hepatic NK1.1−TCRαβ+ cells against NMuLi liver cells after ConA injection was due to impaired binding to target cells, we analyzed the formation of effector-target cell conjugates by flow cytometry. As shown in Fig. 8⇑D, naive (0 h) hepatic NK1.1−TCRαβ+ cells bound to target cells; however, there was no significant difference in binding between LFA-1+/+ and LFA-1−/− mice. Following ConA injection, the adhesion of hepatic NK1.1−TCRαβ+ cells to NMuLi target cells was markedly increased in LFA-1+/+ mice. By contrast, following ConA injection of LFA-1−/− mice, adhesion between hepatic NK1.1−TCRαβ+ cells and NMuLi target cells did not change (Fig. 8⇑D). Similar results were obtained when we used the hepatocyte cell line TLR2 (data not shown). We next examined whether anti-ICAM-1, anti-ICAM-2, or anti-LFA-1 blocking mAbs inhibit the in vitro cytotoxic activity and adhesion of Con A-activated LFA-1+/+ hepatic NK1.1−TCRαβ+ cells to target cells. Cytotoxic activity (Fig. 8⇑E) and cell adhesion of Con A-activated hepatic NK1.1−TCRαβ+ cells to NMuLi liver cells (Fig. 8⇑F) or TLR2 hepatocytes (not shown) were markedly inhibited by blocking mAbs to LFA-1. By contrast, inhibition of ICAM-1 or ICAM-2 had only minor effects on the cytotoxicity and cell adhesion of hepatic NK1.1−TCRαβ+ cells (Fig. 8⇑, E and F). The cytotoxicity assays (Fig. 8⇑, A and E) and cell adhesion assays (Fig. 8⇑, D and F) shown were performed with hepatic NK1.1−TCRαβ+ cells at 24 h after ConA injection and it should be noted that similar results, i.e., defective cytotoxicity and impaired ConA-induced cell adhesion of LFA-1−/− hepatic NK1.1−TCRαβ+ T cells, were also observed at earlier time points (not shown). These results indicate that LFA-1 expression is necessary for the ConA-inducible adhesion between hepatic NK1.1−TCRαβ+ cytotoxic effector cells and liver cell targets. To directly test whether LFA-1 positive hepatic NK1.1−TCRαβ+ cells are required and sufficient for the development of ConA-induced hepatitis, we adoptively transferred “naive” LFA-1+/+ and LFA-1−/− hepatic NK1.1−TCRαβ+ donor cells into LFA-1−/− mice followed by ConA administration. Migration of donor NK1.1−TCRαβ+ cells into the host livers was followed by flow cytometry. Interestingly, migration of hepatic NK1.1−TCRαβ+ cells into the livers was increased as compared with LFA-1+/+ splenic NK1.1−TCRαβ+ cells (Fig. 9⇓A) suggesting the existence of liver-specific homing mechanisms. LFA-1-positive hepatic NK1.1−TCRαβ+ cells confer susceptibility to ConA-induced hepatitis. A, Persistence of splenic or hepatic LFA-1+/+ T cells from in the liver of LFA-1−/− mice following adoptive transfer. LFA-1−/− mice received splenic or hepatic NK1.1−TCRαβ+ cells (1 × 107 cells) from LFA-1+/+ donors via tail vein transfer. Four hours later, liver MNC were analyzed for the presence of transferred splenic or hepatic T cells by flow cytometry. Numbers indicate the percentage of persisting donor T cells. One result representative of three independent experiments is shown. B, “Naive” hepatic NK1.1−TCRαβ+ cells were purified from LFA-1−/− and LFA-1+/+ mice and adoptively transferred to LFA-1−/− hosts. One hour after the cell transfer, hosts were injected with ConA. Serum AST and ALT were measured 12 h after cell transfer. Three mice were used in each group. Mean values of triplicate samples ± SD are shown. 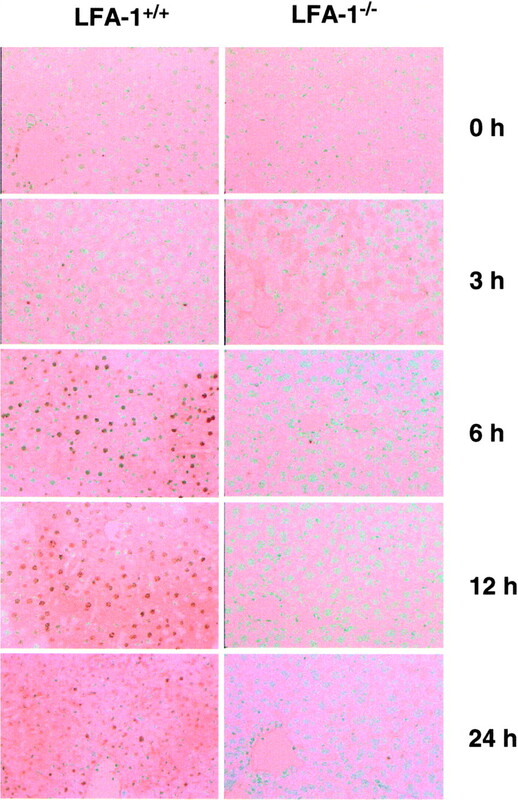 C, Histological examination of livers of LFA-1−/− mice transferred with hepatic NK1.1−TCRαβ+ cells from LFA-1−/− (a) or LFA-1+/+ mice (b) following ConA injection. Magnification, ×100. D, Transferred hepatic NK1.1−TCRαβ+ cells from LFA-1+/+ donors into LFA-1−/− hosts are activated in vivo after ConA injection. Hepatic T cells were isolated and stained with anti-CD69 (FITC), anti-TCRαβ (PE), and biotin-conjugated anti-LFA-1 Abs. Histograms (red lines) indicate surface LFA-1 expression on gated CD69−TCRαβ+ and CD69+TCRαβ+ cells. Black lines indicate the staining with isotype-matched control IgG. Similar results were obtained in two independent experiments. Importantly, transfer of hepatic LFA-1+/+, but not LFA-1−/−, NK1.1−TCRαβ+ cells into LFA-1−/− mice was sufficient to induce ConA liver damage as determined by the liver enzymes AST and ALT (Fig. 9⇑B). Histologically, adoptive transfer of hepatic NK1.1−TCRαβ+ cells from LFA-1+/+ mice into LFA-1−/− hosts resulted in massive accumulation of RBCs in the sinusoidal area and tissue damage (Fig. 9⇑C, right panel). In contrast, no significant histological changes were observed in LFA-1−/− mice following transfer of hepatic LFA-1−/− NK1.1−TCRαβ+ T cells (Fig. 9⇑C, left panel). Moreover, adoptively transferred hepatic NK1.1−TCRαβ+ cells from LFA-1+/+ donors into LFA-1−/− hosts are activated in vivo after ConA injection as determined by CD69 expression (Fig. 9⇑D). Taken together, our results show that LFA-1-positive hepatic NK1.1−TCRαβ+ cells are sufficient and necessary to trigger ConA-induced hepatitis and liver damage. The present study was designed to provide genetic evidence on the role of the cell adhesion receptor LFA-1 in T cell-induced hepatitis. Genetic inactivation of LFA-1 expression in mice completely protects these animals from ConA-induced hepatitis, liver damage, and hepatocyte apoptosis. Whereas activated hepatic T cells remained in the liver of LFA-1+/+ mice and up-regulate LFA-1, activated T cells are rapidly cleared from the livers of LFA-1−/− mice. Mechanistically, hepatic T cells from LFA-1−/− mice showed significantly reduced liver cell cytotoxicity as a result of impaired, activation-dependent adhesion to liver target cells. Furthermore, adoptive transfer of hepatic T cells from LFA-1+/+ mice, but not from LFA-1−/− mice, sensitized LFA-1−/− mice to ConA-induced hepatitis. These results provide the first genetic evidence that the adhesion receptor LFA-1 on activated T cells has a critical role in ConA-induced acute hepatitis. Thus, LFA-1 expression on T cells is necessary to induce liver damage. Following ConA administration, T cells and macrophages release cytokines such as IL-2, IL-1, IL-6, IFN-γ, IL-4, IL-12, or TNF-α as well as nitric oxide that have been linked to the pathogenesis of hepatic lesions (6, 7, 8, 9, 10, 11, 12, 13). Moreover, several cytotoxic effector molecules are considered to be involved in the development of ConA-induced hepatitis. For example, perforin−/− mice fail to develop ConA-induced hepatitis (16). The role of Fas/FasL system in the development of ConA-induced hepatitis is controversial, because FasL-defective gld/gld mice, but not Fas mutant lpr/lpr mice, fail to develop ConA-induced hepatitis (15). Our data show that the absence of LFA-1 has no apparent effect on the serum cytokine production, activation of hepatic T cells, and expression of the cytotoxic effector molecules FasL and perforin. However, ConA-activated hepatic T cells express high levels of the adhesion molecule LFA-1 and loss of LFA-1 results in reduced cytotoxicity and reduced conjugate formation between activated T cells and liver cells. Importantly, these data indicate that attachment of activated T cells to hepatic cells is a critical step in the pathogenesis of T cell-dependent hepatitis. Recently, it has also been shown that NK1.1+TCRαβ+ cells may play a role in ConA-induced hepatitis (13, 24). Moreover, we (22) and other groups (25, 26) have demonstrated that LFA-1−/− mice have reduced numbers of NK T cells in the liver. However, the kinetics and extents of ConA-induced CD69 and CD25 expression were comparable among LFA-1+/+ and LFA-1−/− NK T cells implying that ConA-induced activation of NK T cells is normal in LFA-1−/− mice. Although we cannot exclude that the low numbers of NK T cells in the livers of LFA-1−/− mice may contribute to the lack of hepatic injury, the preserved IL-4 production and normal expression of CD69 and CD25 suggests that LFA-1-deficient NK1.1+TCRαβ+ cells are normally activated in vivo and hence may play a minor role in ConA-mediated liver damage. Furthermore, adoptive transfer of hepatic NK1.1−TCRαβ+ T cells from LFA-1+/+ mice, but not from LFA-1−/− mice, sensitized LFA-1−/− mice to ConA-induced hepatitis. These results show that hepatic NK1.1−TCRαβ+ T cells are sufficient and necessary to mediate liver damage in our model of experimental hepatitis. Thus, NK1.1−TCRαβ+ T cells, but not NK cells, appear to be involved in the development of ConA-induced hepatitis. The leukocyte integrin LFA1 was initially defined by mAbs that inhibit CTL-mediated cytotoxicity in the absence of complement (20). However, LFA1-deficient mice displayed normal CTL responses against systemic choriomeningitis virus and vesicular stomatitis virus infections (21) and loss of LFA-1 alone has only minor effects on the cytotoxicity of NK1.1+TCRαβ+ T cells (22) suggesting that the consequences of anti-LFA1 mAbs may reflect nonspecific effects of Ab treatment, such as capping of other surface molecules. Therefore, the in vivo function of LFA-1 in the generation of cytotoxic T cell responses was unclear and it has been speculated that other adhesion receptors such as CD44 can functionally substitute for the loss of LFA-1 in vivo (22). Therefore, it was very surprising to find that LFA-1−/− mice are completely protected from ConA-induced liver damage and that adoptive transfer of hepatic LFA-1+/+ T cells conferred susceptibility to ConA-induced hepatitis in LFA-1−/− mice. Moreover, although LFA-1 and CD44 cooperate in cell adhesion of lymphokine-activated killer cells to their targets and together control NK cytotoxicity (22), CD44−/− mice show massive ConA-induced hepatitis (our own data (not shown) and Ref. 27). Thus, it appears that the requirement for LFA-1 in T cell-mediated cytotoxicity and tissue damage might depend on the disease model and/or the expression of specific adhesion receptors on the target organ. Based on our results and previous experiments by other groups the following scenario of ConA-mediated acute liver damage emerges: in vivo administration of ConA triggers polyclonal T cell activation (5) and the differentiation of T lymphocytes into cells that produce cytokines such as TNF-α, IFN-γ, or IL-4 (6, 7, 8, 9, 10, 11, 12, 13) and cytotoxic effector cells that express perforin and FasL (14, 15, 16). ConA stimulation also triggers up-regulation of the LFA-1 adhesion receptor (and possibly other adhesion receptors) on T cells. Cytokines such as IFN-γ and TNF-α can induce the expression of ICAM-1 on hepatocytes and nonparenchymal stromal hepatic cells, e.g., sinusoidal endothelial cells (28). LFA-1-dependent attachment of the activated T cells to liver cells is then required to initiate liver cell apoptosis and acute hepatitis. Intriguingly, our genetic data indicate that cell adhesion is a critical and essential step involved in liver cell damage and the pathogenesis of acute hepatitis. Whether LFA-1-dependent T cell adhesion to liver cells is also essential for the development of fulminant disease in other hepatitis models such as endotoxin-induced hepatitis (29) remains to be examined. More than 2 billion people have been infected with hepatitis viruses and ∼1% of people infected with hepatitis viruses develop acute fulminant hepatitis with no effective treatment option (1). Moreover, the liver is a target for autoreactive lymphocytes resulting in autoimmune hepatitis that very often requires transplants (2). In both viral and autoimmune hepatitis, activation of macrophages and T cells are critical initial steps in the pathogenesis of liver damage and fulminant disease (3, 4). Our data in a mouse model of acute T cell-dependent liver damage show that the adhesion receptor LFA-1 is important for the development ConA-induced acute hepatitis. Loss of LFA-1 expression in mutant mice results in a complete protection from disease. Whether LFA-1 would be a potential target for the treatment of T cell-mediated hepatitis and the prevention of liver damage in acute hepatitis needs to be determined. We thank A. Minemura and N. Kubota for critical comments. ↵1 J.M.P. holds a Canadian Research Chair in Cell Biology and is supported by the Premiers Research Excellence Award and Institute of Molecular Biotechnology of the Austrian Academy of Sciences. ↵2 G.M. and S.T. contributed equally to this work and are listed in alphabetical order. ↵4 Abbreviations used in this paper: FasL, Fas ligand; ALT, alanine aminotransferase; AST, aspartate aminotransferase; MNC, mononuclear cell. Tagawa, Y., K. Sekikawa, and Y. Iwakura, Y. 1997. Suppression of concanavalin A-induced hepatitis in IFN-γ−/− mice, but not in TNF-α−/− mice: role for IFN-γ in activating apoptosis of hepatocytes. J. Immunol. 159:1418.